The situation of Edinburgh at but a short distance from the Firth of Forth, and therefore liable to invasion from the sea, has caused the whole length of the east coast of Scotland, from Berwick around to Leith, to be studded with Castle-towers and Keeps, at once the residences of the Court and the defence of the capital. The whole of the country from Edinburgh to the borderland betwixt England and Scotland had thus been erected into a cordon of forts, fitted to repel invasion and to preserve the capital inviolable from assault either from sea or land. And in former times, ere the Crown had attained the supremacy which it now possesses, the Castles soon became the means of overawing the independent Borderers, or were themselves the centres of revolt against the Throne, and the rallying points of the vassals of the rebellious Lords. And all that ever with him be." O’ercame the Welsh and gained the land." In many cases the territorial defences proved efficient, and the sacredness of the capital was preserved. To the Castle of Dunbar some prominence must be given, as the one post in the country which effectually repelled the English invader. Besides exhibiting the force of the Scottish arms against the chosen warriors of England, it has also a history intimately associated with the internecine turmoils in Scotland. The position of Dunbar Castle topographically merits a word of description. The town of Berwick is exactly in meridian with Newburgh in Aberdeenshire, and between these two places the east coast of Scotland is hollowed out into a vast bay, extending at Kirkcaldy to about 45 miles inland from these two points. The influence of the wash of the waters of Forth and Tay must be allowed for when estimating the denuding force of the North Sea; but the contour of the east coast will present peculiar appearances even to the least-skilled observer. One glance at the map of Scotland will satisfy anyone that the power of the North Sea over that country is not to be compared to the influence which the Atlantic has had upon the west coast. For while the North Sea has only transformed the coast line between Peterhead and Berwick into one great bay, the 2000 miles of raging Atlantic Ocean betwixt Skye and Labrador have hollowed the west coast into myriad outlandish forms, where only the stern endurance of the rocks has withstood the perpetual tempest which assails them. The coast of Haddingtonshire has been doubly attacked—by the North Sea on one side, and by the rapid stream of the Forth on the other—so that it presents the appearance of an irregular triangle. About midway on the shore-line stands the ruined Castle of Dunbar, upon a rocky promontory around which the stormy North Sea breaks in foam. The influence of the strong Arctic current is visible here, as it is in the Bay of St Andrews; for the projection of Fifeness bears the same relation to St Andrews as St Abb’s Head does to Dunbar. The resistless surge of the North Sea, dashing for centuries upon the slenderly-protected east coast, has thus gradually eaten its way inwards towards the heart of Scotland; whilst the furious Atlantic Ocean, fiercely assaulting the barren and rocky coast-line on the west coast has won from the mainland many a green-crested islet, many a solitary peak, fitted alone to become the eyrie of the eagle or dauntless sea-birds. The very position of Dunbar Castle shows that the encroachments of the sea in that quarter should not be disregarded. Its ruins now stand upon a rocky eminence, exposed to the fury of the wintry blast; and the stormy sea, which has caverned and honeycombed the rock upon which it is raised, has left many chasms and tunnels in the cliff, regarding which a thousand wild legends are told. Though the exact date of the Castle, the ruins of which now remain, is not known, it must occupy the site of a much earlier Peel which would be in existence early in the 11th century. The first traces of this early structure are found in the records relating to William the Conqueror. In 1067, that monarch conferred the Earldom of Northumberland upon Robert Comyn, but he was so unpopular with his vassals that he and all his retainers were put to death in 1068 by the inhabitants of the district. Then Cospatrick (sometimes called "Gospatrick ") grandson of Malcolm II., King of Scotland, claimed the Earldom through his mother, who was a daughter of Uchtred, the Saxon Earl of Northumberland, but had ultimately to pay "a great sum of money" for it in 1067 to William the Conqueror. Soon afterwards Cospatrick quarrelled with William, and fled into Scotland with other northern leaders, finding refuge in 1072 with Malcolm III. (Ceanmor), whose wife, St Margaret, was a Saxon Princess. Malcolm conferred upon him "Dunbar with the adjacent lands in Lothian," and he thus became the first Earl of Dunbar. His death took place about 1089, and he was succeeded by his son, Cospatrick, second Earl of Dunbar, who was a benefactor to the Abbey of Kelso. Before his death in 1139, he had probably begun the erection of Dunbar Castle, as the oldest part of the ruins belong to about that period. This Earl was present at the foundation of Scone Abbey in 1115, and Holyrood Abbey in 1128, the former by Alexander I., and the latter by his brother and successor, David I., sons of Malcolm III. (Ceanmor). An’ ilk ane by a Knicht! Whom bewty pleased the sicht." Like many more of the Scottish Castles the date of the original Dunbar Castle is unknown, and many outrageous theories have been invented to account for its existence. The tradition of the locality ascribed its origin to the Picts, who at some remote period left the fertile hills and meads of their native Allemayne, and extravasated themselves upon the east coast of Scotland. Originally agriculturists, the necessities of their position forced them to learn to wield the sword as well as guide the ploughshare, for the savage aborigines did not resign their land without a fierce and protracted struggle. And if these eastern strangers did really build an early Keep on the site of the Castle (which may be reasonably doubted) they must have adopted the method of Nehemiah, "For the builders, every one had his sword girded by his side; and so builded," thus carrying both the sword and trowel. The mission of the Alemanni was essentially agricultural, and when they had established their colony in East Lothian they soon set about clearing the forest land and transforming the waste places into fertile fields. The Caledonians, like the Indians of North America, were content to leave their rude agriculture to their women and children, whilst they devoted their energies to the chase; but the Picts had already learned all the humanising influence of agricultural pursuits, and knew something of the benefits derived from living in Society. Under their influence, therefore, the fringe of the great Caledonian Forest was reclaimed from its barren luxuriance; and the desolate haunts of the wild boar and giant elk of Scotland were forced to yield subsistence to these pioneers of civilization. And now the traces of this influence may be seen in the agriculture of the district, whose fertility is unlimited even by the saline breezes which blow over two sides of East Lothian. Although there is no proof that any part of the Castle of Dunbar was built by these hardy colonists, it is not unlikely that a Keep of some kind was erected by them near the coast, so as at once to protect their fields and to afford them means of escape by sea should Fortune frown upon them. And there could be no site chosen more fitted for this purpose upon the whole of the neighbouring coast. No competent Admiral would counsel an attack by sea; and the subsequent history of Dunbar Castle showed that it could successfully resist an overwhelmingly land force, even under daring and skilled leaders. When the union of the Picts and Scots took place under Kenneth I. (Macalpin) about 846 A.D., the lands and Castle of Lodonia (Lothian) fell into his hands. The title which the fort now received was "Dunbar," to account for which two theories are propounded. It is said that amongst the chieftains that followed Kenneth, one of the bravest was Bar, whose courageous bearing and ready sword had won the notice of the King. In acknowledgment of his services the Pictish fort was conferred upon him, and it was thenceforth known as "Dun-Bar," the Castle of Bar. Another theory holds that the title is purely topographical and descriptive, and, being interpreted, signifies "the fort on the height," which name it undoubtedly deserves. The debate, however, is a barren one, and hardly worthy of the labour that has been spent upon it. Indeed, authorities have not yet decided who the Picts were, and where they came from. Some theorists maintain that the Picts were Saxon invaders; others declare that they were a sept of the ancient Caledonians who devoted themselves to agriculture. One thing at least is certain, that the two nations were united under one King in the person of Kenneth I. about 846 A.D., and it is at this period that the name of Dunbar first appears. It must be understood that the Pictish origin of Dunbar Castle is entirely traditional, though it seems not incredible. From Kenneth I. the whole long succession of Kings of Scotland and of Great Britain are descended. That there was really a Castle on this spot over a thousand years ago is certainly true, however strange it may sound. And though it has long been in a ruinous state, the story of its chequered career is inwoven with the web of Scottish history, and its name is inseparably associated with some of the greater events which are now deemed memorable. The mist and obscurity which surround the record of its early days become cleared as we advance within the historic period; and from the time at which Dunbar was erected into an Earldom it is not so difficult to follow its story. Yet the darker portion of that story should be known, since it makes much of the general history of Scotland intelligible. The true Kingdom of Scotland was not really founded upon a secure basis before the time of Malcolm Ill. (Caenmor) about 200 years after Kenneth I. The union of Malcolm with St Margaret of England brought about a revolution in the manners and customs of the Scottish nation which more nearly assimilated them to their southern neighbours. The relics of Druidical religion had now disappeared, and the humanizing wave of Christianity, which had reached the remote shores of Norway, had also brought its influence to bear upon "Ultima Thule," the fabled last island on the verge of the world, over which Malcolm was King. And so, as the light dawned upon these "rude forefathers" of ours they began to see that man is neither absolutely self-existent, nor existent solely for self. Around the Castles and Towers of their leaders they congregated into little townships and petty estates, espousing the cause of their Lord without question, and laying the foundation of the feudal system which it took centuries to overthrow. The mere association thus together, with one distinct aim, served to consolidate the Kingdom and make its independence more secure. It is important to remember that the borders of England then extended much further north than they did in later times. The Forth was really the boundary of England instead of the Tweed; and the Wall of Antoninus, which extended from the Forth to the Clyde, was more nearly the margin of the Southern Kingdom than the Cheviots. Indeed, the whole land betwixt the Forth and the Humber was continually changing masters, and the insecurity of the conquests of either party made it doubtful as to where the boundaries of the two kingdoms should be set. Thus, when David I. reigned, though then possessed of Lothian, the Scottish Crown had but an insecure hold upon Northumberland and York. The reign of his grandson, William the Lion, however, sufficiently settled the matter, for after his foolish escapade at Alnwick and Carlisle in 1174, when he was taken prisoner and carried to England and France, he was compelled to do homage to Henry II., not only for the territories betwixt the Humber and Tweed, but also for the whole Kingdom of Scotland; thus establishing the unpatriotic usage of which Edward I. availed himself afterwards in his disputes with the Claimants to the Scottish Crown. It will thus be seen that for a considerable time Dunbar was as much an English as a Scottish stronghold. And the indefiniteness of its nationality made it an object of envy to both parties. So around this ancient Keep, which stood defiantly upon the brink of the Eastern Sea, there clustered many memories of former times, and many hopes for the future of Scotland which could never be fulfilled. The strength of the Castle, which rendered it almost impregnable, and the extent of the accommodation which it afforded, ever made it a coveted point in protracted warfare; and its possessor might easily sway the balance of fortune and decide the fate of either Kingdom. It was, therefore, important for the welfare of Scotland that the Castle of Dunbar should be in the hands of a true patriot. Unfortunately this was not always the case, and the history of the Castle alternates between treason and fidelity to the Scottish cause. The incident by which Cospatrick, Earl of Dunbar, came to Lothian and was possessor of a Castle and a title has been already explained. When King John of England, in reprisal of a Scottish Border raid, marched into the land at the head of his army, and laid siege to the Castle of Dunbar, he was compelled to abandon his purpose, and leave the stronghold in the hands of its owner, Patrick, sixth Earl of Dunbar. Unfortunately for Scotland’s welfare some of the earls were not always faithful to Scotland. Patrick, eighth Earl, who liberated Alexander III. by surprising Edinburgh Castle, when held by the Comyns, became one of the Regents of Scotland after Alexander’s death. His son, Patrick, ninth Earl, surnamed "Black Beard," was the first to be styled "Earl of March." Unlike his father he swore fealty to Edward I., and was a faithful adherent of the English interest. His wife, Marjory Comyn, daughter of the Earl of Buchan, took up the cause of the other party, and held the Castle of Dunbar for King John Balliol until forced to surrender it to Edward I. in 1296, who made the Earl two years afterwards, "King’s Lieutenant in Scotland." Both he and his heir were present at the Battle of Caerlaverock in 1300, when Edward’s party won the Castle. The tenth Earl of Dunbar and March, Patrick, like his father, was devoted to the King of England, and when Edward II. was escaping after losing the Battle of Bannockburn, in 1314, he sheltered the fugitive at Dunbar Castle, and procured a fishing-boat to take him to England. This tenth Earl was a "trimmer," and made his peace with Robert Bruce when he saw that Bruce was to be in the ascendant, and he was made Scottish Governor of Berwick Castle, a post which he held till the defeat of the Scots at Halidon Hill in 1333 forced him to surrender. While he was away, Dunbar was brought into notice through the persistent bravery of his wife, Agnes Randolph, daughter of the famous Thomas Randolph, Earl of Moray, the comrade of Robert Bruce, and also a grand-niece of Bruce, known in history as "Black Agnes." The story has been often told alike in prose histories and ballads, but will bear repetition in connection with the Castle of Dunbar. "The Castle of Dunbar, notwithstanding a heavy siege, held out manfully, and because the Countess of Dunbar, who was the principal guardian of the Castle, was sister of the Earl of Moray, then a prisoner at Nottingham, the English brought him down to Dunbar in April 1338, threatening that if the Countess did not surrender the Castle, they would put her brother to death; to which she answered, ‘If you do this I shall be heir to the Earldom of Moray," for her brother had no children. The English, however, did not wish to put the Earl to death, and sent him back to England to be detained in custody as before." There is a curious incident in this siege which is not widely known. The English attacking party was under the command of William de Montacute, Earl of Salisbury. Finding that the methods of attack adopted by him were not proving successful, he descended to a little silent treachery. He had gained the ear of some of the servants in the Castle, who, with the knowledge of the Countess, had planned to give the Earl and a few followers admission at the great gate. Attended by some of his most daring knights, Salisbury approached the main entrance at midnight. As arranged, he found the drawbridge down and the portcullis raised, so that the entrance to the place was open to him. But one of his followers, more forward than the rest and eager to be noticed by the leader, pressed forward even before the Earl, and was the first to enter within the precincts. No sooner had he passed the sacred line than the portcullis descended between him and his companions, and the Earl with the remainder of his party had to beat a hasty retreat ere the rising drawbridge should entrap them and prevent their escape. Thus by one moment’s precipitation the chance of capturing the English leader was lost, much to the chagrin of the Countess. ‘Nor storm nor midnight stops our foes. The Thistle shall out-thorn the Rose! ‘"
Thus ended the Siege of Dunbar, and thus the hand of a feeble woman, when nerved by patriotism and armed with chosen Scottish valour, was sufficient to checkmate the plots and schemes which the English politicians had laid for the overthrow of Scotland. The English oysid to make karping. I found Annot at the gate!'" During the War of Independence in Scotland, no friends had been truer to each other in weal and woe, than Randolph, Earl of Moray, and the valiant Sir James Douglas. As companions-in-arms they had shared the toils of many a battlefield side by side, and though rivals for renown, each beheld the other’s advancement without one pang of envy. But in the course of time an estrangement arose betwixt these two families after the demise of the leaders, and ere a hundred years had flown the descendants of Douglas and Randolph were deadly enemies. Doubtless this was largely owing to the rapid increase of power which the Douglases had gained on the Border, and which the Earl of Dunbar and March—descendants of Randolph on the female side—-resented as an encroachment on their own territory. The middle marches of the Border were now under the control of the Douglas faction; and the Earls of Dunbar and March were restricted to the eastern division of this part of the country by their neighbouring compatriots as rigidly as though they had been foreigners in the land. The cause of the ultimate rupture betwixt these two powerful noblemen was peculiar. The unhappy King, Robert III., whose mind lay rather towards legislative reform than battlefields, was not competent to use the mailed hand that the times demanded; and his brother, afterwards Regent; Duke of Albany, made the King his unwilling supporter. In the fulness of parental pride the King had made his son, the Duke of Rothesay, Governor of the Kingdom, but the levity of his conduct and the partial methods of his judgments soon estranged the nobility from him. The deep-laid schemes of his uncle, the Duke of Albany, who coveted the Throne, were not unknown to him, but he affected to disdain duplicity. The vacillating and weak-minded Robert III., wishful to obtain peace at any price, allowed his brother, the politic Duke of Albany, to carry out his ambitious plans. He made it known among the Scottish nobility that the Duke of Rothesay, the heir-apparent to the Crown, would require to be married, to maintain the succession, and the hand of the Duke would be assigned to the highest bidder. Foremost among the match-making nobles was George, eleventh Earl of Dunbar and March, who had a daughter Elizabeth of marriageable age; and it was intimated to him that if he could produce an adequate dowry his daughter might be prospective Queen. By some means the Earl fulfilled the conditions, and the Lady Elizabeth of Dunbar was declared to be the betrothed bride of the Duke of Rothesay. The Earl of Douglas, however, had also a daughter of a suitable age for wedlock, and as his revenues vastly exceeded those of Dunbar, he saw a brilliant opportunity before him of ennobling his family by a connection with the Throne, and by the same stroke discomfitting his rival. The Duke of Albany astutely saw that whichever bride was chosen the result would be misfortune to his nephew, from the raising of one of two powerful enemies against him. Rothesay himself seems to have been indifferent, as he did not mean to be faithful to either bride, so he languidly acquiesced to whatever his uncle Albany proposed, and received the daughter of Douglas with as little regard as he would have bestowed upon the heiress of Dunbar. But the Earl of Dunbar and March could not bear the insult and contumely thus heaped upon him. Retiring from the Court to his Castle of Dunbar, he summoned his retainers around him, and prepared to open negotiations with the Court of England. Leaving Dunbar strongly garrisoned in the care of one of his near kinsmen, he journeyed himself to England expecting to receive the command of a contingent to invade Scotland. No sooner had the Earl of Douglas heard of the preparations which the Earl of Dunbar and March had made than he assembled his own overwhelming band of followers and, marching straight to Dunbar Castle, invested it closely. This display of power so terrified the fainthearted Governor that he surrendered without striking a single blow. This completed the power of Douglas, since he had Dunbar, Bothwell, and Douglas Castles in his possession, which controlled all entrance to the south of Scotland. The succession of the Earls of Dunbar and March, thus rudely broken, was never thoroughly re-established. Than mightier heroes of a longer date. But History’s purchased page to call them great? A wider space, an ornamented grave? Their hopes were not less warm; their works were full as brave." The most interesting episodes in the history of Dunbar Castle are those which relate to the connection of Mary, Queen of Scots, with this desolate ruin. After the ruthless murderers had perpetrated the outrage which they had long meditated, the very success of their plot found them unprepared for the results which followed. The suspicion of the weak and vacillating Darnley on the one hand, and their well-grounded doubt of the faithfulness of the arch-traitor and hypocrite, Moray, perplexed the leaders of the assassination. The high-spirited manner in which the Queen denounced their brutality led some of them to think that the safest way for them would be to fulfil the threat with which Ruthven quieted her, and "cut her into collops and throw her over the wall"; the difficulty in which they were placed was a serious one. With Darnley at their head, and in the presence of the Queen, they had committed "murder most foul and most unnatural" by the assassination of Rizzio; and the question arose as to what should be done with the Sovereign who was now in their hands. The escape of the Queen with Darnley from Holyrood has been often narrated. The fugitives directed their way to Dunbar Castle. Her residence there, though short, was sufficient to strike terror into the hearth of the conspirators against the Throne; and when she returned a few days afterwards to Musselburgh, it was to resume the power of which she had been so nearly deprived. Very different was her next visit to this sea-beaten tower. Is hope’s last gleam in man’s extremity. The heart still follows from the loneliest shore." A new actor now appears on the scene. The Earl of Bothwell, Lord High Admiral of Scotland, Sheriff of Haddington, and Captain of Dunbar Castle, had made himself extremely busy in political affairs. His bold appearance and invincible conduct quailed all his opponents, and carried terror to the hearts of the conspirators, who, with him, had brought about the murder of Darnley, and whom he swayed as he wished. Queen Mary had visited her infant son at Stirling Castle, and on the morning of 24th April 1567 she left Linlithgow Palace for Holyrood, with a small retinue; and Bothwell, as High Sheriff of East Lothian, had put himself at the head of a thousand armed followers, and intercepted the Queen at Foulbriggs (now Fountainbridge), and carried her off forcibly to his Castle of Dunbar, and, clasping the arm of the fair Queen of Scots with his own rude mailed gauntlet, he led his dejected captive within its walls. Picture the misery of the poor Queen at this juncture: her husband murdered by the agency of her captor, her son secluded from her in a distant fortress, and her own person in the power of a reckless and unprincipled wretch, whose lawless passions impelled him to unrestrained iniquity. The dark story of her sojourn at Dunbar if fully known would throw an entirely new light upon a very dubious episode, which has been interpreted to her discredit, without proof, by her antagonists. My youth’s bright morning dies. The scourge of ruthless Fate? The shroud their love enfold. And as she heard the step of her hateful captor approaching her chamber would not her mind dwell upon those gentle and loving words which her murdered spouse had addressed to her in the full hey-day of youth and love? The wale of woman heid. Shall cause me be content! Farewell, I say no more!" The gay King Henry’s farewell had been realised, and the Queen had to endure the insolence and the lawlessness of his cruel murderer. The Bride of France, the Queen of Scotland, was now the leman of an unprincipled Border Chief, whose meed was the gallows, had each man his due. Ten days after her solitary confinement in Dunbar Castle, the Queen was bidden to accompany her captor (now raised to the rank of Duke of Orkney) to Edinburgh. She expected to be taken to Holyrood, but instead she was conveyed to Edinburgh Castle. Bothwell still thought that he was acting as a freeman, but he was really playing into the hands of the Associate Lords. He stealthily carried the Queen to Borthwick Castle, but he was soon followed by the Regent Moray’s troops, who invested the place, but had not artillery to besiege it. He escaped by a secret passage, leaving the Queen to the mercy of the soldiers. She donned the costume of a cavalier, mounted a horse, and was making her way towards Edinburgh Castle, when her captor appeared, seized her reins, and led her once more to Dunbar Castle. Queen Mary’s association with this stronghold has been fully explained. It only now remains to say that it was at Dunbar where Bothwell devised the Battle of Carberry Hill which proved so fatal to the hapless Queen. The Regent’s troops overcame Bothwell’s scanty force, and Mary was captured, conveyed a prisoner to Edinburgh, and thence to incarceration in Loch Leven Castle. The Regent Moray, in December 1567, obtained an Act of Parliament directing the demolition of Dunbar Castle and the Fort on Inchkeith, which, however, was not immediately put in execution. Not until the army of Moray returned victoriously from Langside, in May 1568, did he set himself deliberately to destroy Dunbar Castle, as being a fitting emblem of his triumph over the Queen. But all is quiet as Eremit’s howff, and stilliche as the grave." 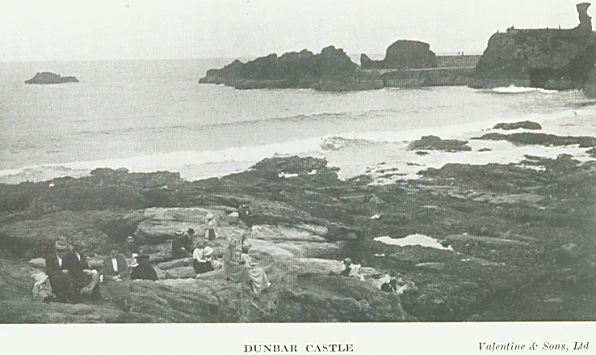 The ruins of Dunbar Castle belong by heritage to the Earl of Home, as representing the Douglas family, to whom the structure belonged in early days.